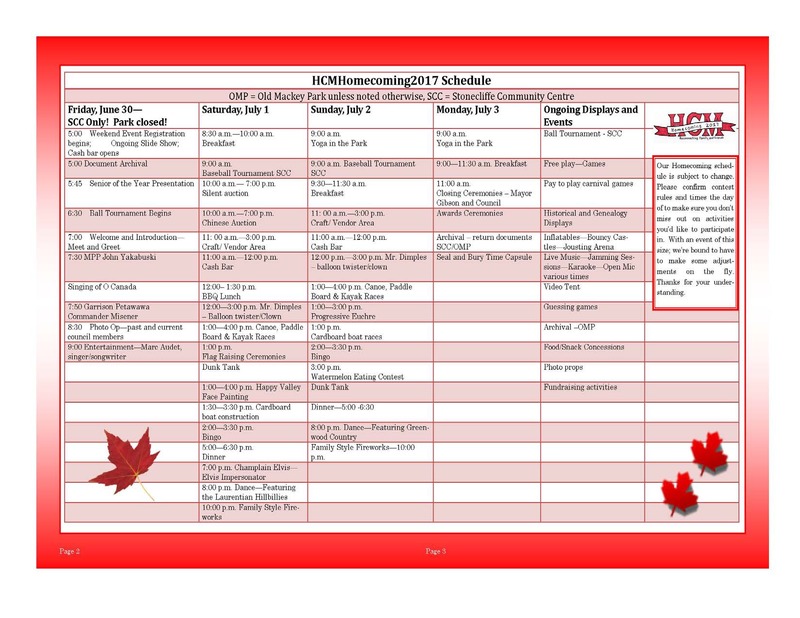 Watch this page for: changes to regular meeting schedules; notices of special meetings; notices of changes to by-laws or policies; Council and/or staff changes; or listings of current or special events. Since 2016, Head, Clara & Maria has been able to provide upgrades to our municipal boat launches and Old Mackey Park with support from the Government of Canada through the Canada 150 Community Infrastructure Program. Upgrades include: upgraded washroom facilities, new docks, solar lighting, permanent garbage and recycling bear proof containers, permanent picnic tables, hand wash stations and pest control. Improvements have been made at each boat launch in Deux Rivieres, Stonecliffe and Mackey, as well as our municipal park on Jennings Road in Mackey. Our goals were increased health and safety of users while increasing use of our outdoor facilities. We hope you enjoy the improvements to our boat launch and park facilities as you enjoy our natural playground. ​Email contact: hcmhomecoming2017@gmail.com for more info. List will be updated as plans fall in place!